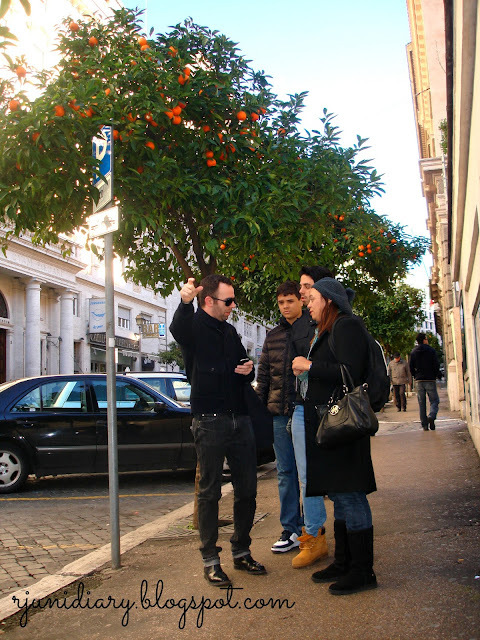 One thing I've discovered about Rome is that orange trees are everywhere, and during my visit on the first week of February 2013, they're all bearing fruits! After enjoying Fontana de Trevi, my newly met friend Danniel and I decided to proceed to one of the baroque churches in the city- Santa Maria della Vittoria. 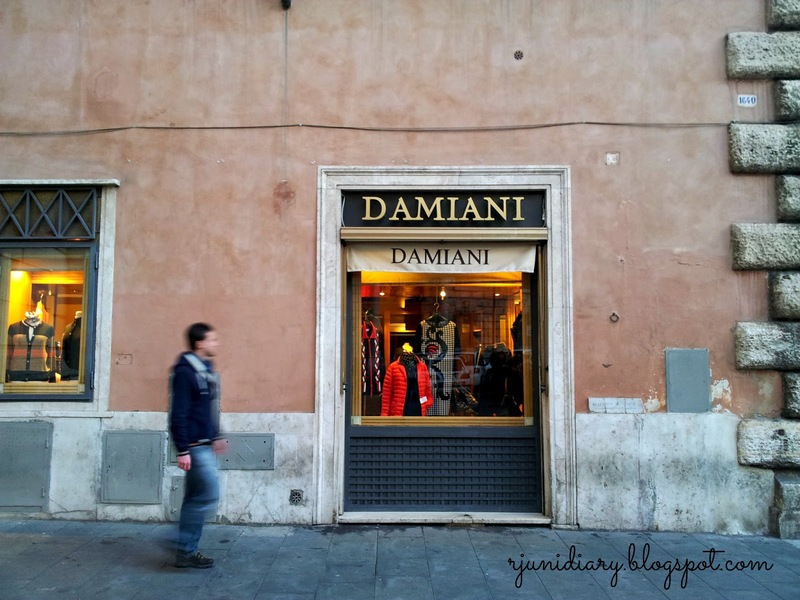 We walked through Via del Tritone and finally Via Barberini where I took this photograph. There were lots of people walking along these orange-adorned streets in Rome- locals and tourists, but I had observed that nobody dared to pick one of these brightly coloured and delicious-looking fruits! Ripe oranges were left hanging on the bending branches setting my salivary glands off to squirt thereby leaving my mouth entirely flooded. Curious, I stopped to ask one local who's having a morning break from work outside the building. With a very typical Italian hand gesture, she told me that those oranges were not very palatable, they're sour and bitter! Three hours before my flight back to London, I was still rushing along the streets and alleys around Piazza Navona which really seemed like pathways in the maze to me. Just before crossing Corso Vittorio Emanuele to catch the bus to Metropolitana di Roma's Repubblica station, this massive, ancient wall of a building in Piazza di S. Pantaleo caught my attention. 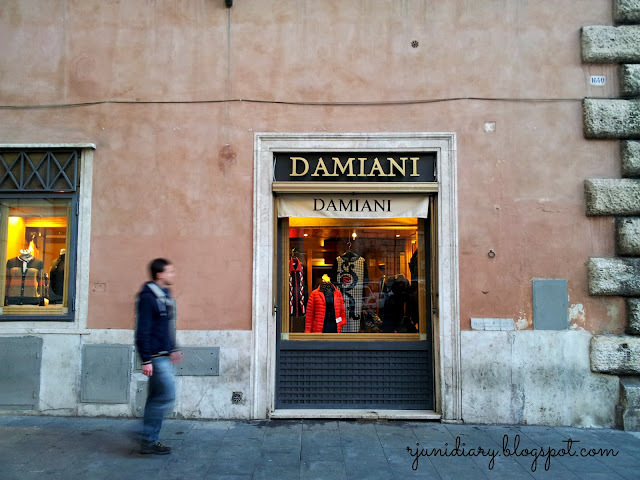 It houses one of Italy's leading designer botiques; and since shopping was on the bottom of my list, I didn't enter... I took my mobile phone out and used its built-in camera to capture this angle, instead. Hi, RJ. It's been a long time. So you're in Rome? For the conclave? Hihi. Lesson on the oranges: not everything that looks delish is delish. I visited Rome on the first week of February 2013, and 3 days after I left, the pope announced he's resigning! ...back in South Australia now, back to the university. Rome is beautiful, so unique!